Historically, phased-array radar systems have been large in both cost and weight. With the explosive growth of UAVs and unmanned ground vehicles (UGVs) as key elements of the defense arsenal, the need for lighter phased-array radar systems in these weight-sensitive systems will continue to grow. In addition, the increased use of such radars for non-military applications, such as tornado detection by the US National Weather Service (Springfield, MO), is helping drive the demand for lower-cost systems. Fortunately, these growing demands placed on phased-array radar systems can be met with the help of modern RF/microwave integrated-circuit (IC) and monolithic-microwave-integrated-circuit (MMIC) technologies. The benefits of phased-array radar systems far outweigh their limitations, thus accounting for their growing use in many military electronic systems and platforms. Since beam steering in phased arrays can be performed at millisecond and faster speeds, the signal can jump from one target to the next very quickly, while frequency agility can be used to search quickly across a sector for targets. The coverage of a phased-array antenna beam is typically limited to a 120-deg. sector in azimuth and elevation. While this response is a known limitation of phased arrays, mechanically scanned radar systems also have limitations in the physical area available for the motion of the antenna. 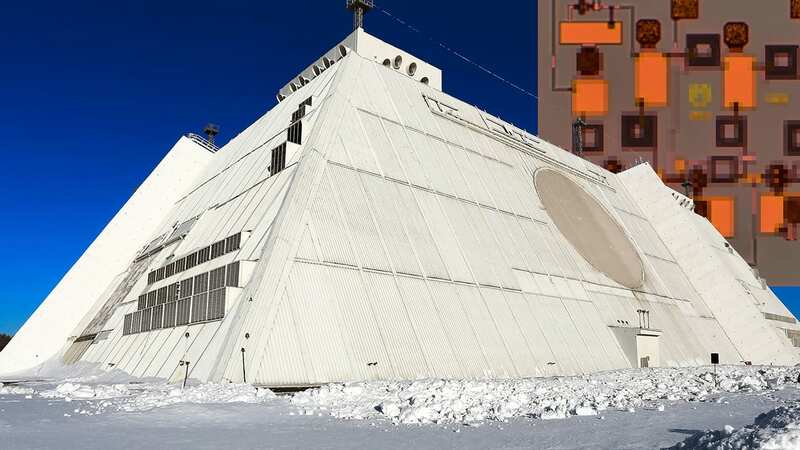 Important factors hindering the adoption of phased-array radar systems in many applications continue to be size, weight, power, and cost (SWAP-C). Efforts aimed at minimizing these four attributes represent a significant technological challenge that until recently has seemed a rather formidable hurdle. Phased array radars are, after all, quite complex and even growing in this regard as target identification becomes more difficult. How can SWAP-C reduction be accomplished? A phased-array radar system (Fig. 1) is constructed from large numbers (often thousands) of transmit/receive (T/R) modules which enable the array to function as both a transmitter and a receiver. Initially designed with discrete hybrid components such as amplifiers, filter, mixers, phase shifters, and switches, these modules are now more commonly fabricated with high-frequency IC or MMIC technology. This switchover to IC technology has provided tremendous benefits in terms of SWAP-C reduction, but simply replacing components can only get a designer so far. Gaining additional SWaP-C benefits in any phased-array radar system also requires knowledge of how to best apply available IC and MMIC technologies to the system (Fig. 2). In fact, the key characteristics of size, weight, and power consumption in a phased-array radar system can usually be minimized by analyzing the design at the circuit, system, and technology levels. Analysis at the technology level first involves a choice of semiconductor material. Modern commercial semiconductor foundries typically offer a number of different material technologies, but a choice among these is not always straightforward. Components in high-frequency T/R modules typically include high-power amplifiers (HPAs) for transmit purposes, low-noise amplifiers (LNAs) for receiving purposes, mixers and oscillators for signal translation (frequency upconversion and downconversion), and attenuators, filters, and switches for signal conditioning. Fabricating MMICs for all of these functions will likely require more than one semiconductor technology. For example, processes based on silicon-carbide (SiC) or gallium nitride (GaN) substrates will excel in higher-power portions of the system such as transmit functions, while processes using silicon-germanium (SiGe) or gallium-arsenide (GaAs) materials will exhibit lower noise for better performance in receiver functions. Analysis at the system and circuit levels should be closely intertwined, as a system is only as good as the sum of its components. Unfortunately, the vast majority of IC and MMIC circuit suppliers do not give enough consideration to any specific system, opting instead to create generic components that can be used across wide reaching applications. Such an approach, while cost-effective in terms of IC and MMIC development, is not always optimal in reducing SWaP-C since these components cannot be easily customized for use in phased array systems. Forward-thinking MMIC suppliers, such as Custom MMIC, have worked on approaches that combine technology, system, and circuit analysis to create components that resolve SWaP-C challenges in phased array systems. At the technology level, they have worked with nearly all of the world’s commercial III-V semiconductor foundries, and have intimate knowledge of some of the newest processes including optical pHEMT and high frequency GaN. At the system level, they have been engaged with numerous phased array designers and have heard first-hand how yesterday’s components are holding back development of next-generation low cost, low weight, high performance systems. At the circuit level, they have created an extensive intellectual property (IP) design library of components in both die and packaged form that are used as a starting point for advanced signal chain design and optimization. As an example, one place where they have focused significant development is the transmit HPA, a common component required in almost every application. At microwave and millimeter-wave frequencies, the transmit amplifier is often fabricated from a depletion mode pHEMT process, a highly efficient and mature technology. However, depletion mode pHEMT is not without its drawbacks, most notably the need for negative gate voltage and a sequencing procedure to ensure the gate voltage is applied before the drain voltage, lest the FET device suffer irreparable harm. By their very nature, negative voltages and sequencing circuits for HPAs are expensive in terms of complexity, board space, and cost of the extra components. In phased arrays, especially ones with thousands of elements, such HPAs place enormous strain on the system as a whole and offer significant barriers to SWaP-C reduction. Therefore, as part of a Small Business Innovative Research grant (SBIR) from the U. S. Army, they attacked this problem for the transmit portion of an X-band phased array system. Rather than utilize depletion mode pHEMT, they turned to enhancement mode pHEMT for the HPA, a technology often relegated to other applications such as high-speed logic circuitry or switches. In enhancement mode, the pHEMT is normally off until a positive voltage is applied to the gate. Negative voltages are no longer required, nor are voltage sequencers, since either the control or the drain voltage can be applied first; the amplifier will not turn on until both are present. In the end, they were able to replace the existing depletion mode PA with an enhancement mode design that delivered 5 dB more gain, 1 dB more power, and 2 dB improved linearity, all while dissipating 25% less DC power. In terms of SWaP-C, the benefits of enhancement mode PAs are enormous, and offer a significant breakthrough for microwave system designers in general. A second problem they considered was the receiver LNA in an X-band phased array system as part of a separate SBIR contract. Here, they also switched from a depletion mode to an enhancement mode process, thereby eliminating the negative voltages and sequencers of the existing solution. Their resulting design had 1 dB lower noise figure, 8 dB more gain, an eight-fold reduction in DC power, and half the unit cost of the existing depletion mode solution. However, they soon encountered an application that called for a pair of relatively well-matched LNAs, one for each of the two polarizations in the return signal. Starting with their enhancement mode LNA, they created a dual version on one MMIC die, thereby guaranteeing a matched pair. They also worked with their packaging vendor to develop a low cost rectangular QFN plastic package to best match the resulting die size. The end result was a “standard” product that was anything but ordinary, as it combined innovation at the circuit, system, and technological levels to deliver a component with significant impact on SWaP-C.
Moving forward, they are continuing to develop components for phased array radar systems and similarly challenged 5G wireless systems. Using other technologies such as high frequency GaN, and a combination of different semiconductor devices in multi-chip modules, they’re looking to help designers when digital control functions must be integrated with higher frequency functions.